​An inner fire makes me long to paint; this fire frees my spirit and feeds my mind. The minute I put my brush on canvas or paper my thoughts seem to calm down, as if to focus and make sense ‘of it all’. This process often results in vibrant, bold colour applications. When I apply pigment- strokes of vibrant juicy and rich colours- a painting takes shape and I feel that inner glow - brilliant, beaming, glorious, joyful radiance. I forget about time and space, it is like meditating and letting my mind ‘float away’. Once I finish a painting I feel mostly tired, but happily ‘empty’ as my emotions, my fire and energy got transferred onto the canvas leaving me refreshed to soak in anew what life has to offer. My approach is very simplified and focused by only using the three primary colours. However, the best available artist’s paints make it a joy to create a limitless number of different shades, values and colours. I enjoy painting from life. When I paint outside, ‘en plein air’, I try to capture the moment, the light, the sound and the smell of the air as if to take the viewer with me to the place, but still leave enough room for their own interpretation. Because the winters are very cold in New Brunswick, I am forced to paint indoors during the colder months. During those times I explore new ways, try new products and approaches. Don't go camping without them! Click on the banner and save 15%. Look for the coupon code at the top of the page on the Harvest Host website. www.Heffrons.com recently received a testimonial from a customer named Eric who has always enjoyed a good project and fixing up old things. 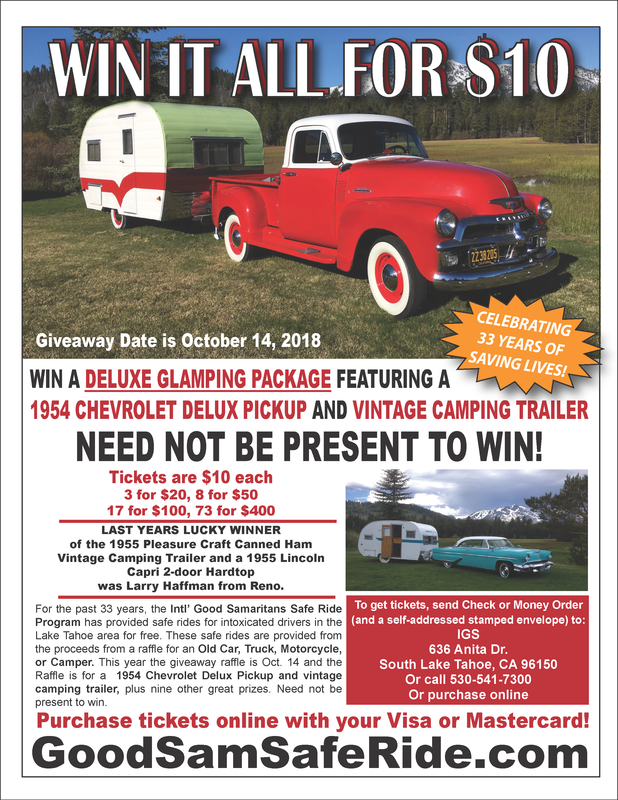 His family had a 1964 Alaskan Camper when he was in high school. 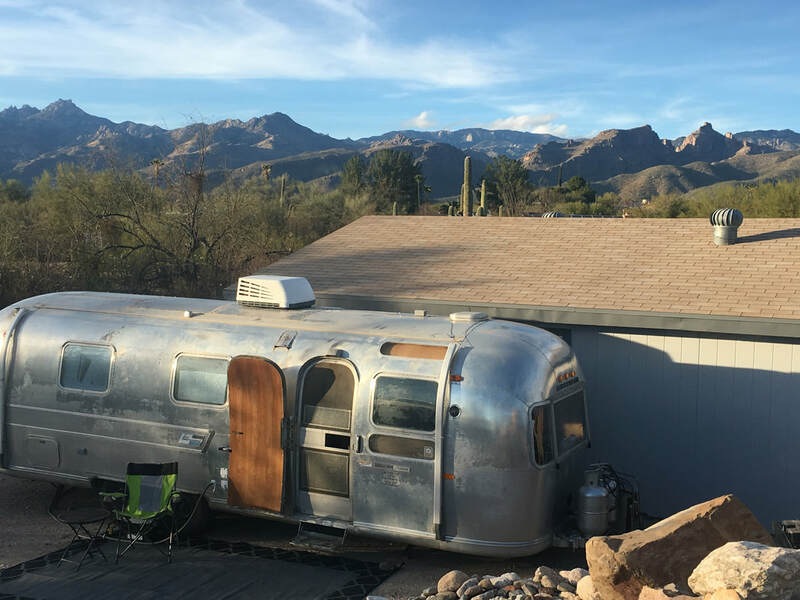 Fast forward to today, and after 2 years of searching, he bought a 1971 Airstream. Eric was happy to share with us his adventure and transformation which you can read below. I drew up the plan in CAD and I’m happy to say that I was able to pretty much stay with the original design that I had come up with. I have remodeled and built many homes but this was the hardest thing I’ve ever done. Planning for gas electric and 12 V throughout the trailer was a bit of a task. In my experience the RV world appliances are not user-friendly to obtain information on and install. I thought when I got to the woodwork it would be a piece a cake. I love working with angles and I have worked on many boats and difficult projects. Airstream trailers are in a different class. I spent two days just putting the wood up in the front. There wasn’t a single piece of wood that didn’t go in and out at least 3-4 times. I got it livable and stayed in a week. I did some more work and took it out on a 2 month road trip. 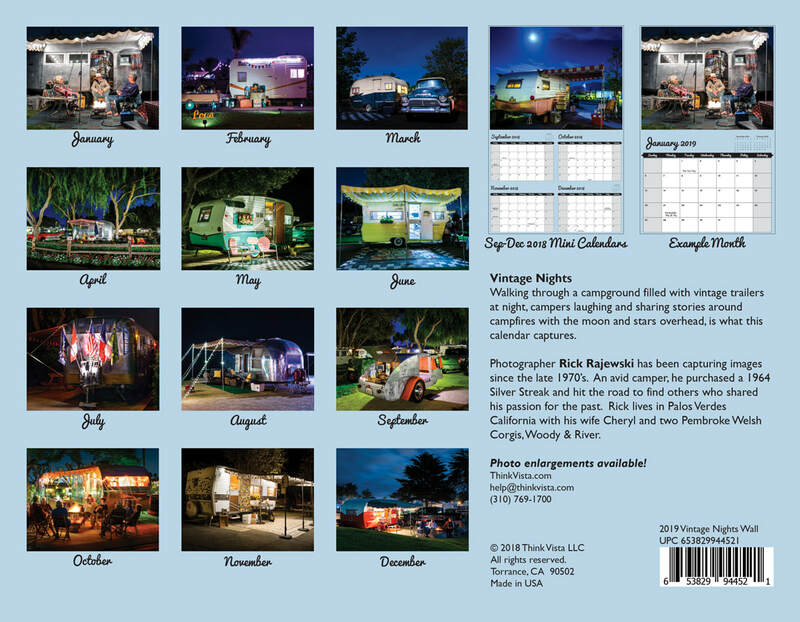 During my trip I met lots of people with trailers and Airstreams and visited some Airstream shops. Turns out I was on the right track all along and many people have asked me to share my story. As of this writing it’s at about 90% now, but she will never be done of course! We couldn’t be more happy for Eric and glad to hear his restoration was a successful one. Every photo Heffrons receives from customers is unique because a little part of the customer can be found through their hard work and vision. 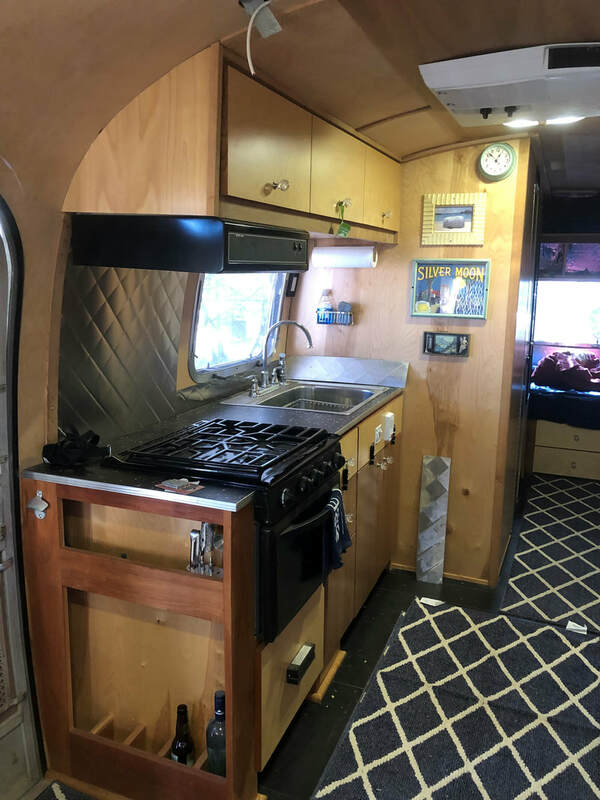 No matter the project, big or small, we hope this story give you insight and inspiration of what is possible and help you come up with ideas for your own camper, trailer or motor home. To learn more you can visit our website: www.Heffrons.com. We look forward to hearing from you! 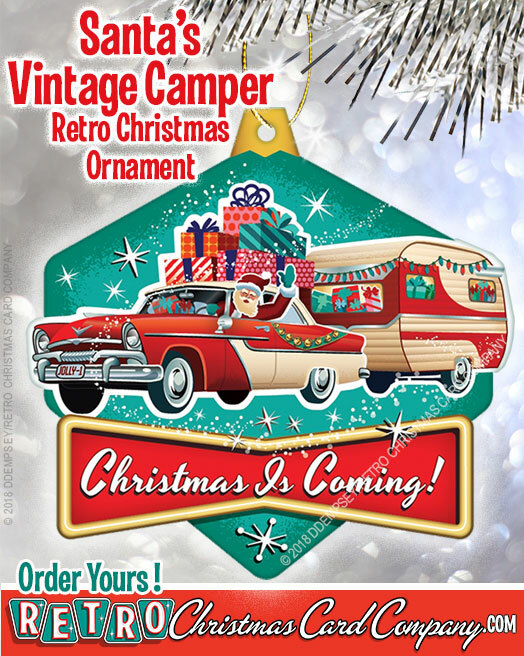 ...continued from issue #41 of The Vintage Camper Trailers Magazine. I knew the ceiling over the kitchen area had leaked in the past because it sagged a bit and was soft to the touch. This I would repair in the future. Well, the future arrived sooner than later! During the winter months, I was smelling mildew? While inspecting the ceiling, pushing on it harder, IT ALL FELL THROUGH!!! Wet rotted wood and insulation. Oh Crap! I learned a lot while working on the Scotty, which made the second round easier. I hope that some of my repair descriptions will help others with their projects. Of course, the first thing was to inspect the roof when the weather was decent enough to remove the tarp. After cleaning it, I removed all the old dried caulking that was peeling away around the vents. 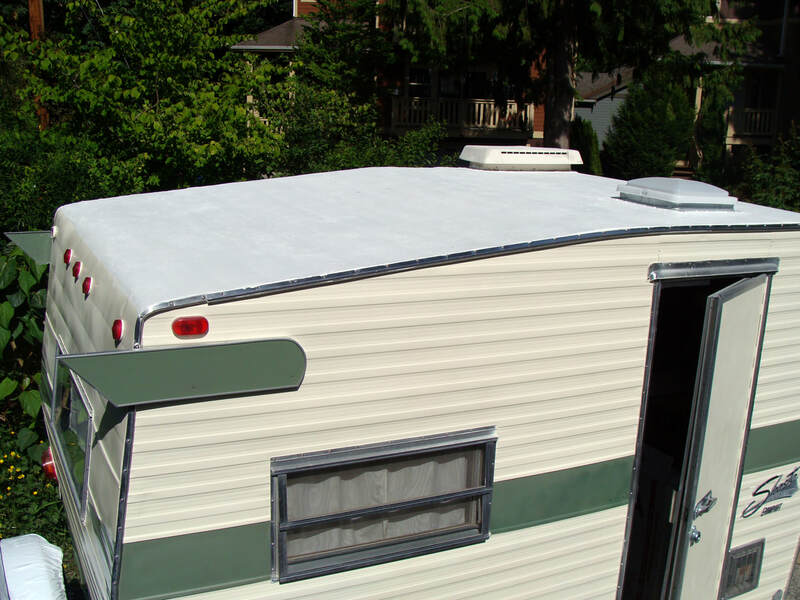 After applying new caulking, I had purchased one gallon of “Kool Seal” 63-600 White Reflective Roof Coating with a Ten-year Warranty. This product is made for roofing and half the cost of the advertised “Flex Seal”. Their calculations said that I would need one and one-half gallons for my eight by ten roof. I thought that I would test the coverage of one gallon first. You can roll it or brush it on. I used a brush, going cross direction on each dried coat for tensile strength, while covering the caulking for an extra seal. The one gallon with three coats was solid enough. Of course, the amount of roof seal will depend on the condition of one’s roof. With the roof now weather proofed, I replaced the rotted ceiling supports and insulation. The thickness of the old paneling left a gap large enough that I did not have to remove the cupboards to install a sheet of patterned vinyl from Home Depot. After cutting out the section for the refrigerator area, I applied contractors glue onto the new supports. I was able to slip the flexible vinyl through the gaps between the walls and the ceiling, which covered the ceiling in the cupboards and the closets without having to piece it. The patience (with Two people) was to slide the edges into the existing plastic groves which held the paneling. Then white upholstery tacks were used on the supports for extra hold. I was going to paint the yellowed vinyl tack paper over the back half of the ceiling white. But, figured that after I had taped off areas and probably painted two coats, it would be easier and faster to install the same matching vinyl that’s over the kitchen area. After my cuts, we test fitted the vinyl. Then applied the glue in lines about five inches apart onto the back side, then put the sheet in place. Continuing with the upholstery tacks into the existing wood ceiling about twelve inches apart. Well, we weren’t going to stand there with our arms up, holding it until the glue dried! I pre-planned having two, two-by-fours about five feet in length running the width of the trailer with two-by-four posts pushed against these and the floor to hold it all up until it dried for two days. Not only did this white vinyl add a fresh new look but gave the effect of a taller and larger space. At our age, we wanted a toilet. The full-length closet was not large enough for the porta potty and maneuverability. I removed the wall between the full closet and the storage closet. Narrowing the storage closet and widening the toilet room by eight inches. I then painted the brown paneling an off white to make the toilet room brighter and less claustrophobic. After returning two different porta potties that were more for children. I highly recommend the Thetford Curve Pota Potti Toilet. The seat and the height are just right for adults. Plus, the battery flush button allows for a small flush first, so the (you know) doesn’t stick to the trap door when flushing. Don’t forget to remove the batteries when in storage so they don’t corrode. I replaced the old 12-volt light fixtures with new 12-volt LED fixtures, including one in the toilet room. Replaced the 110-volt bulbs with LED’s. Since I was going through all the work removing, cleaning, polishing the outside aluminum trims, and applying new butyl tape. I was not going to put on the old dull and rusted bolts and screws. I invested in stainless steel. (About 300) SWEET! It all looks shiny and new! I had taken some photos to the auto repair shop that advertises nationally to paint your car for $399. to ask on the cost to have them paint the trailer? “WHAT? That cost more than I paid for the trailer!”. “Well that’s not going to happen!” BEWARE for trickery advertising. Those ads we see on TV for a car paint special for $399. THAT IS FOR THE PAINT ONLY! That price does not include the prep work, the taping, the actual painting! I decided to repaint the entire trailer myself. This was not difficult for me as an artist to get the nice consistency to achieve the final sheen. The trick to not getting runs, is to spray many light layers until all was evenly covered. (about four-five layers). We wanted an antique look, not the pure white that it was. 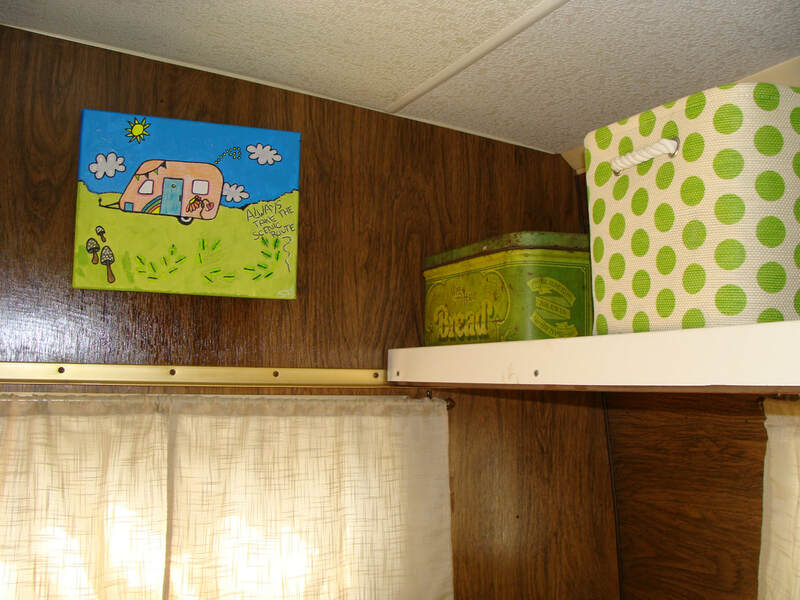 It took twelve cans of “Gloss White Canvas” to paint the entire trailer. (Three green for the accents, Two black for the tongue and rear bumper). About $85.00 total in paint! It looks great until one day I can get it professionally painted. I repainted the outside red trim and the red wooden wings a green trim that is a close color to my SUV. Adding the arrow head shapes to the front and the back for some pizzazz. The same on the wheel hubs. We kept the wonderful original lime green speckled linoleum which is a nice contrast to the darker inside paneling. I am attracted to the color of green. With many hues to coordinate, greens are pleasant while having a calming effect, as the color spectrum throughout nature. 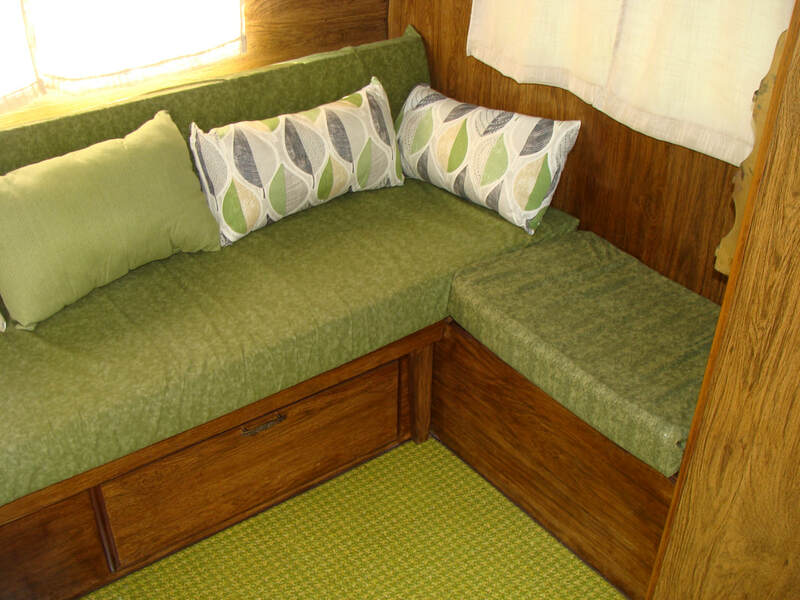 We purchased green coordinating fabrics, and I sewed the cushion covers, new curtains, and accent pillows. We kept the overall color theme solid due to the small space. We enjoy seeing the wild decorated trailers, but, too many things and patterns would send my head spinning without having a cocktail! 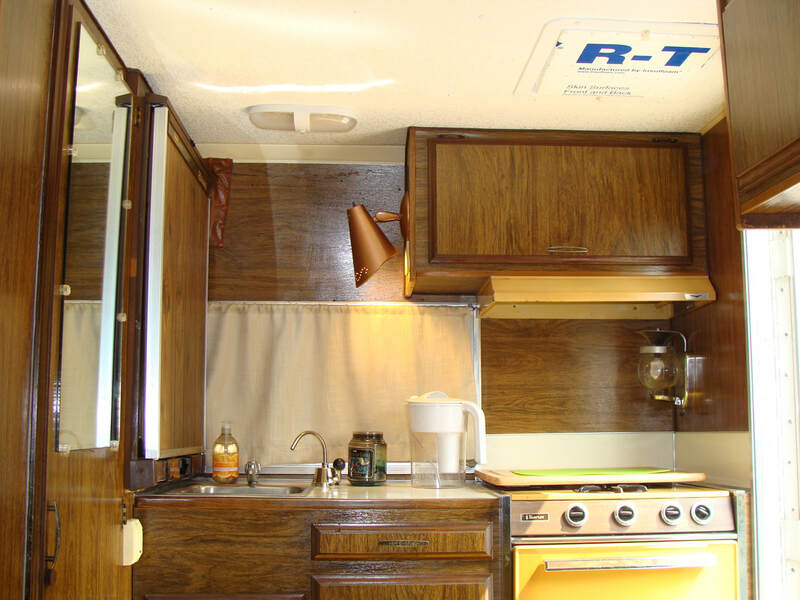 Because the interior was too dark with the original solid aluminum ceiling vent. I replaced it with a white plastic one. (Big difference having natural light coming through) TIP: To keep the trailer cooler on hot days with the sun and heat coming through the white vent. I cut a one-inch thick piece of sheet Styrofoam that has the foil on one side, the size of the vent facing up to reflect the heat. Adding two small wing bolts opposite to hold it in place. This probably can be done with foil over cardboard. Not needing the folding bunk. I removed the larger platform (saving it and the cushion for future sell) and put a piece of three-inch floor molding across the front of the smaller platform to keep things from falling off while traveling. I decided to leave the white primer as it accented the white ceiling and white table top. Also, as a reminder to not hit our heads when sitting. An idea came to raise the front of that platform by six inches, so it didn’t feel like sitting under a shelf. I cut two pieces of wood that is one half by one and a half inches at six-inch lengths and then stained them. I glued Velcro on the ends, and Velcro where the ends will rest to raise the platform after the trailer is parked. “Voila!”. Since the old paneling had scuff marks. I went over all of it with dark, scratch covering furniture polish. That looked nice for a couple of weeks until the old dried paneling had soaked it all in! Dull again? It took two quarts of stain to cover all the paneling. The wood was so dry that the stain didn’t drip much as it was sucked in! The paneling now looks new! The previous owner had reversed the axles, which raised the trailer about 4-5 inches. This looked odd at first. Then, I remembered how the Scotty Trailer’s rear end would hit the ground of a sloped driveway or when other obstacles interfered. We want to be able to take it off road, so the extra height was fine. Stepping up into the trailer was awkward, so I had a fold out step installed. While at this rally, I noticed a trailers canopy with a curved upward crown, giving the under canopy extra height, instead of sagging, especially when it rained. Inquiring? He purchased some quarter inch diameter flexible tent poles. Since his wife had sewn the canopy herself, she added little pockets to the inside corners to hold the tent poles. While cutting one tent pole shorter to fit the diagonal. He did not know that there was a cable inside to hold the flexing. He described how difficult it was to pull the cable out and reattach it. During my research on EBAY tent poles. I found one-half inch Chimney Cleaning Poles in a set of six, each at four feet long. (solid without a cable inside). I took our custom-made 8’x 8’ canopy and sewed pockets into the corners. NOTE: Do not cut the rods by the square root for the diagonal because they will be too short for the uplift of the canopy. With your canopy installed, take three rods screwed together, put one end of the rod into a pocket, bend the rod upwards to figure how tight you want the uplift, then cut the length if needed. Once the rods are set into the diagonal corner pockets, you need to tie or (Velcro) the crossing top rods so they do not snake out of position. The icing on the cake for our KEEPER, are the new Baby Moon Hubcaps!!! Christening it with a logo designed and made by my brother-in-law, Monte Williams, in the shape of a hammock, “Relaxin”. Notice how the X hangs over like a leg! 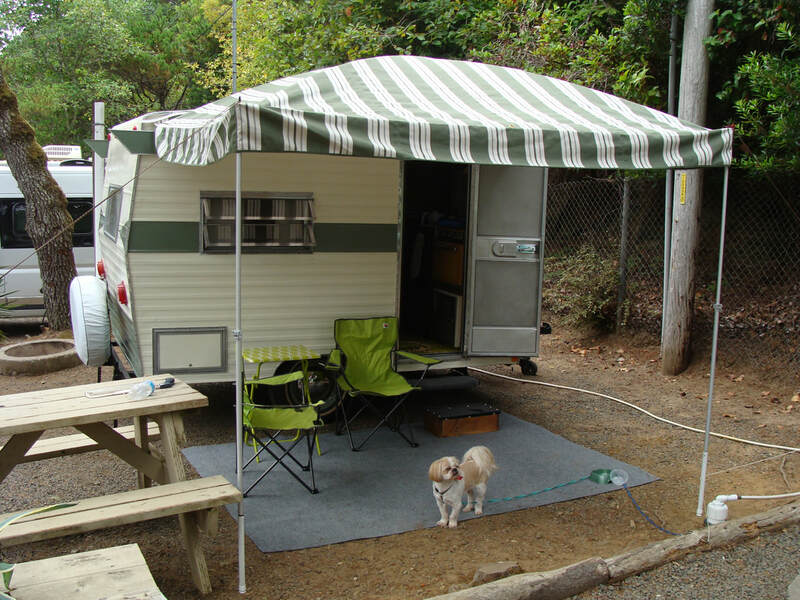 We’ll christen our Shasta on a camping trip to celebrate our thirtieth anniversary! 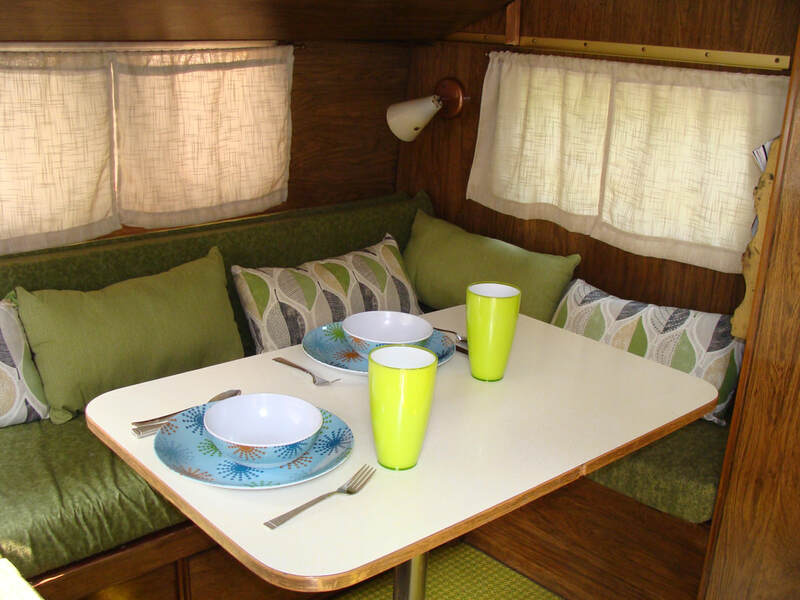 Vintage trailers can be the perfect solution for the part-time or beginner camper. 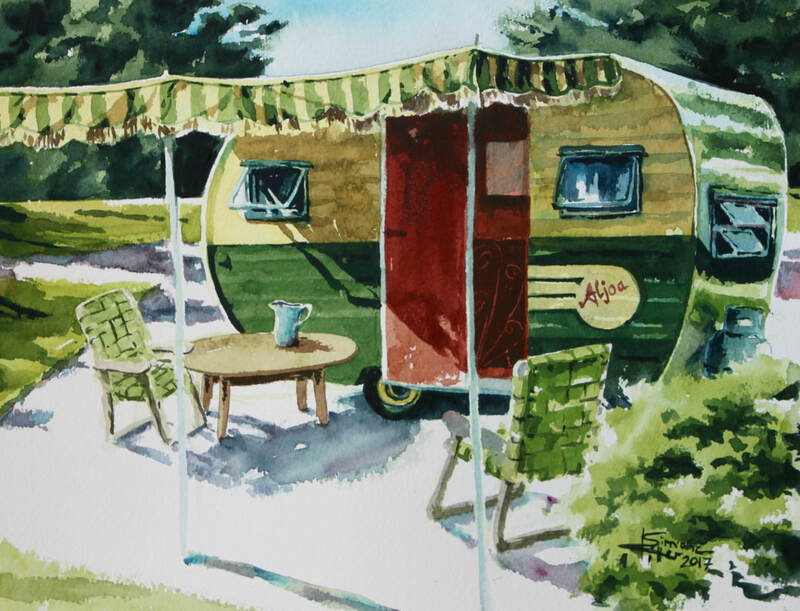 Often a vintage trailer can be picked up at the fraction of the cost of a new trailer and simple repairs or decorating can be made as time and money permits. 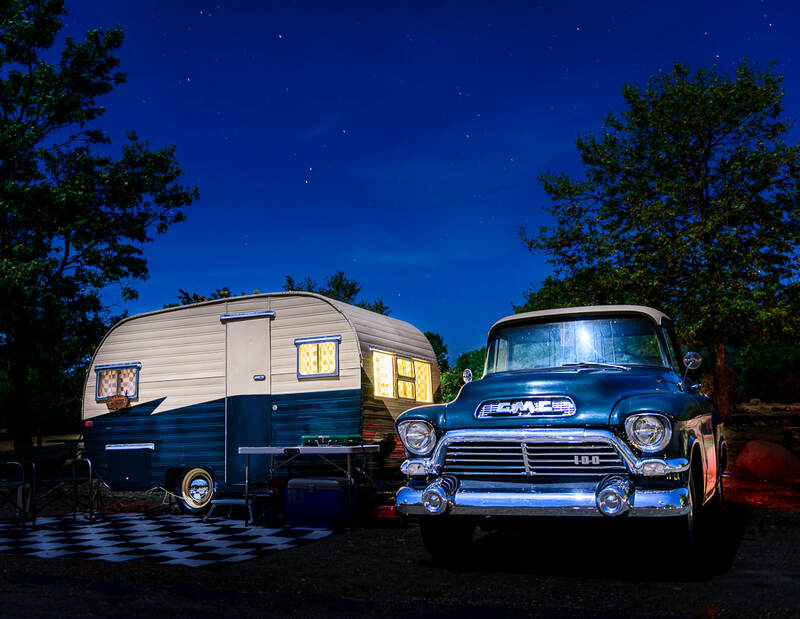 Vintage trailerites, are often drawn to vintage trailers because of their classic styling and the memories that they evoke. 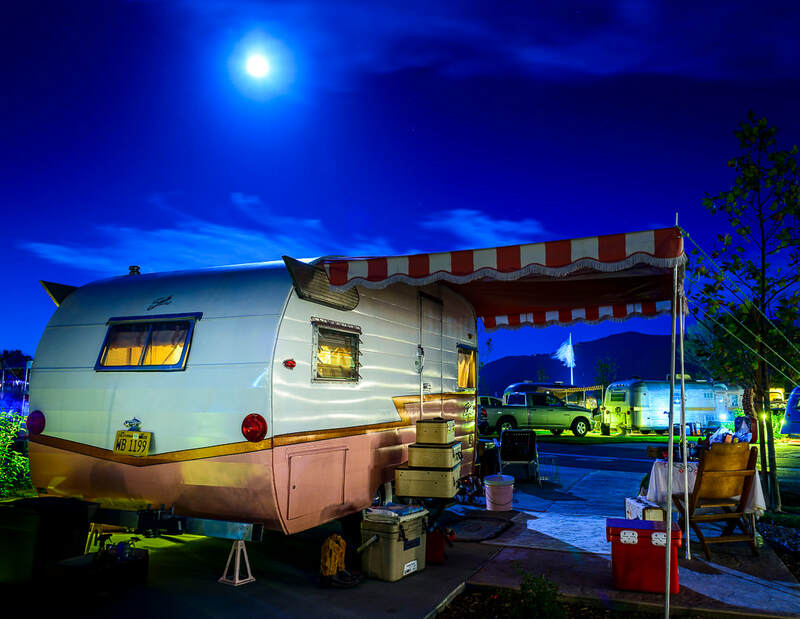 If you are considering the purchase of a vintage trailer, or just admire their timeless beauty, visiting a vintage trailer rally may be something you want to add to your bucket list. 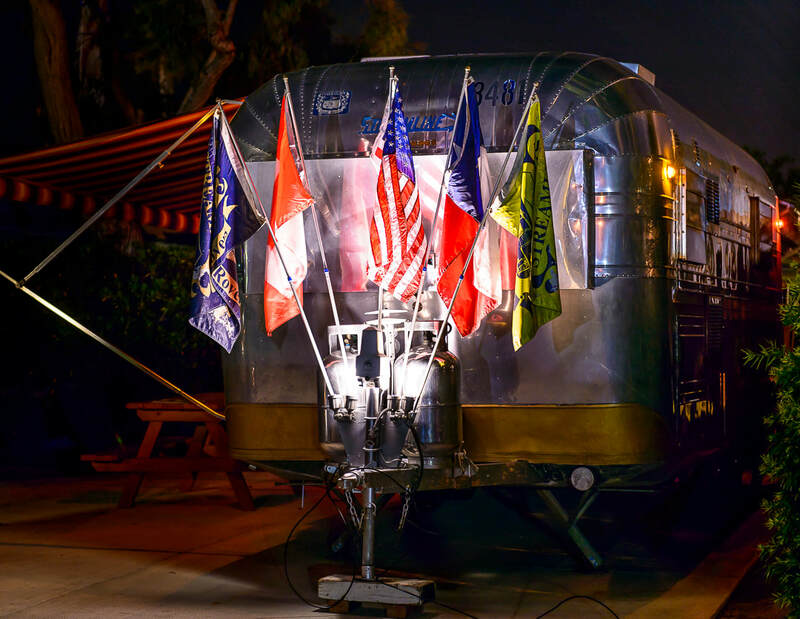 Vintage trailer rallies and shows are held across the USA. Chances are, there is a rally not far from you. 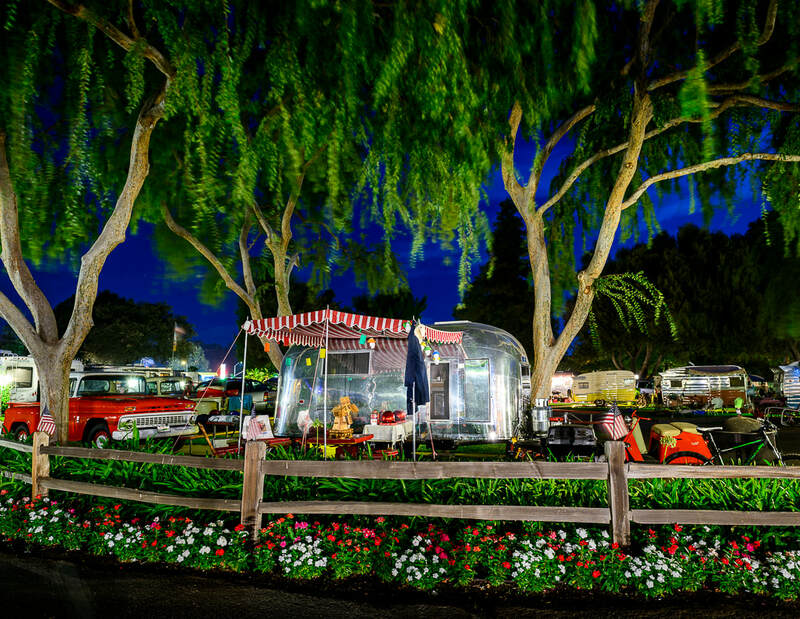 Having attended and hosted vintage trailer rallies for over a decade, I can tell you that far and away my favorite time in the park is after dark. The trailers’ natural wood interiors take on a glow that can be admired through the window or screen door as you stroll through the park. The exteriors are often illuminated with colorful lights that create a sense of whimsy. 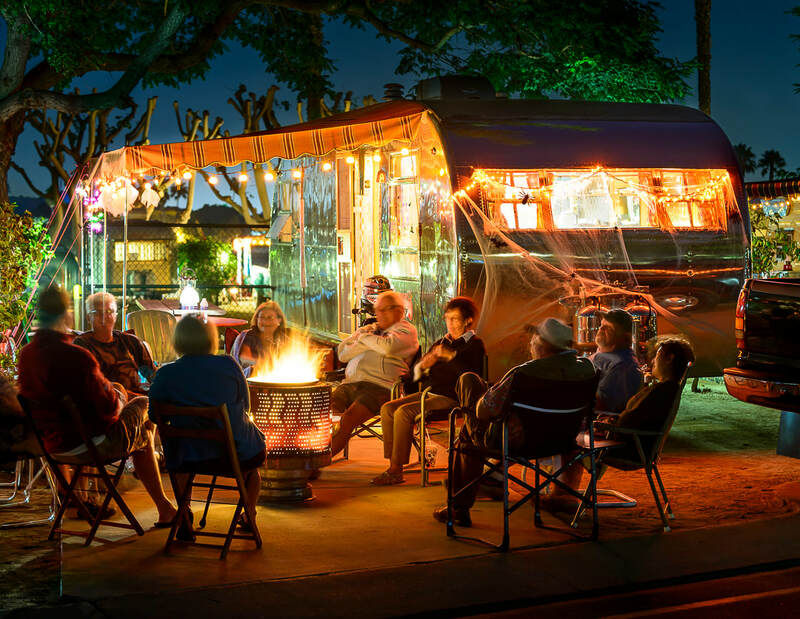 With crackling campfires, laughter and usually a guitar or other instruments heard throughout the park, all of your senses can feel the camaraderie and friendships that are formed on each and every trip. To get the weight slip, I went to a full-service truck stop that had a Florida-certified scale, towed the Shasta onto the scale, unhitched the trailer from the tow vehicle, and drove the vehicle off the scale. The scale operator weighed the Shasta and printed out a certified weight slip. After hooking up to the trailer, I towed it to a local police station and showed the person at the information desk the document that needed to be signed by an active police officer. A policeman came out and looked at the old Georgia registration slip and told me the VIN doesn’t look like any VIN he’s ever seen. I explained that most vintage trailers don’t have VINs because they weren’t issued back then, but they have serial numbers that are used in place of VINs. Either he didn’t believe me or was just curious, but he took the registration slip and went into an office to log onto Georgia’s DMV website. He came out a few minutes later and said the number is legit. He then followed me outside and matched the number on the Shasta’s frame to the number on the Georgia registration slip, then signed the certified document with his name and badge number. Use a registration service to help you obtain a new registration. ​Camping may be a fun activity, but it comes with some safety issues if you aren’t prepared. Campfires, grills, rough terrain on the trails, weather, and animals/insects are all things you need to think about, and when you have your pet with you, it’s important to consider his safety and comfort as well. Here are some of the best tips on how to do just that. 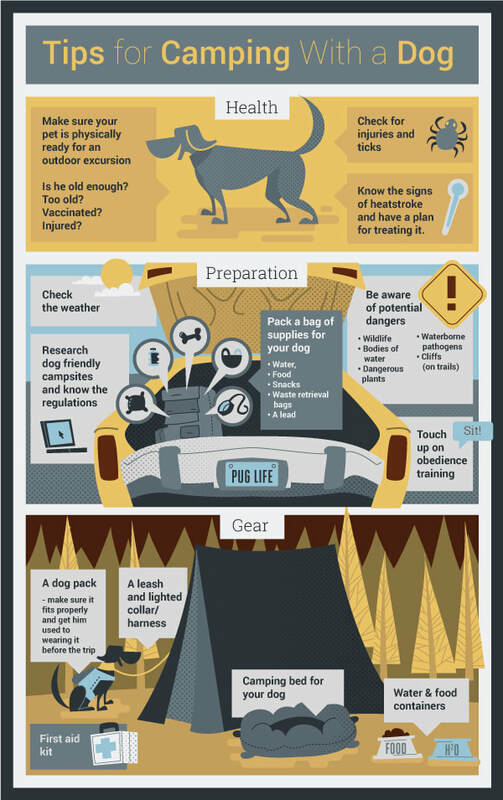 Taking a few precautions before leaving for your camping trip will ensure that your dog stays safe. Make checklists when packing so you don’t forget anything, and take your pup to the vet a few days before the trip to make sure he’s in good health. In issue #30 of the VCT Magazine we shared the before photos of this rare find. The restoration of the fiberglass body proved to be extremely difficult. The fiberglass had black mold throughout that had to be removed. The ceiling was buckling and had to be completely replaced. Once those repairs were made, getting the trailer to line up correctly was another challenge. Flyte Camp only had an empty shell to work off of, so they were recreating the interior with their flare based on vintage photos. 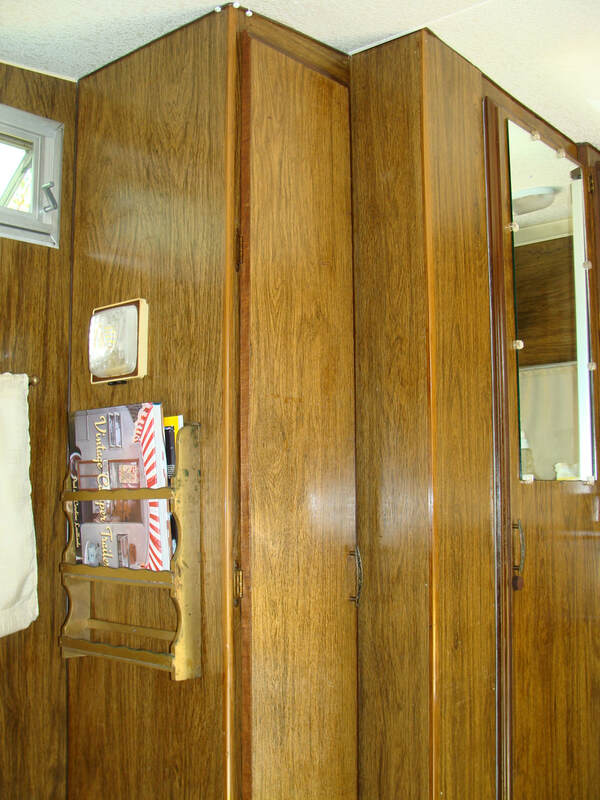 Anna wanted to highlight the design-forward window lines so the cabinetry was customized to expose them more than they were in the original design of the trailer. 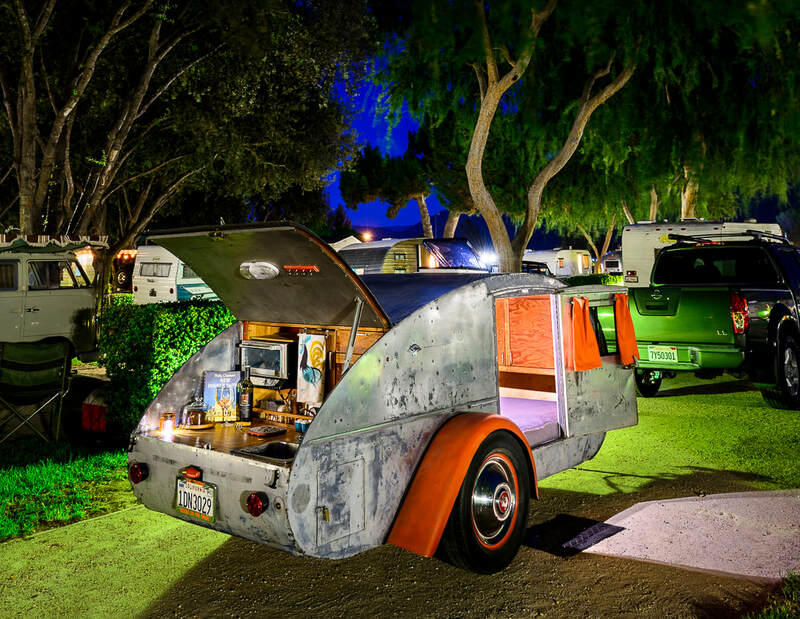 This article was originally printed in Issue #30 of the Vintage Camper Trailers Magazine. If you google “Holiday House Geographic”, you will find several versions of the history of these rare trailers. What is known is that David Holmes, the president of “Harry and David” (mail-order fruit baskets and gifts) was looking for ways to keep his workers busy during the January to July “off season”. 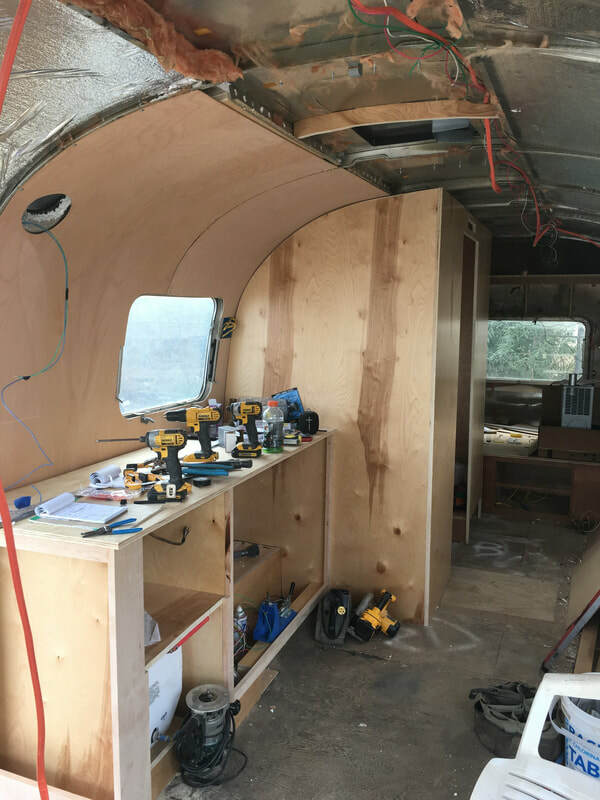 He decided to have his workers build a new travel trailer with a very modern design. 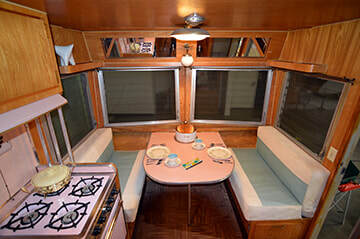 Holmes’ new “Holiday House” travel trailers were based on the standard aluminum skin over a wood frame construction, but the overall styling was very modern and “space age”. They were much different than the more familiar “canned ham” styles being produced in the late 1950’s. 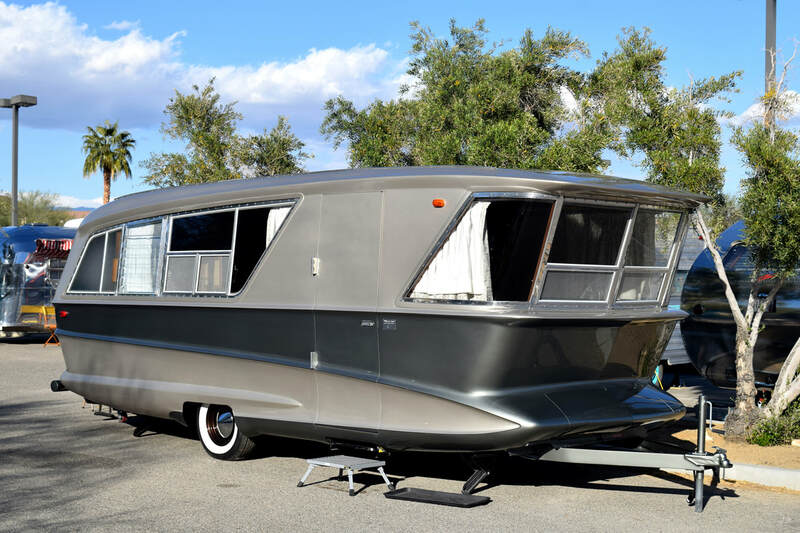 “Holiday House” trailer production began at the Medford, Oregon plant on November 2, 1959 and reached full production level by February 1960. The Geographic’s expensive price tag of $8,495 (In 1960 you could buy a house for $13,000), was likely the reason no units were sold. In 1962 the Showroom Model was sold to Joyce Woodin, the showroom manager, for $5,000. She kept all the original sales and service receipts and brochures that came with the trailer. 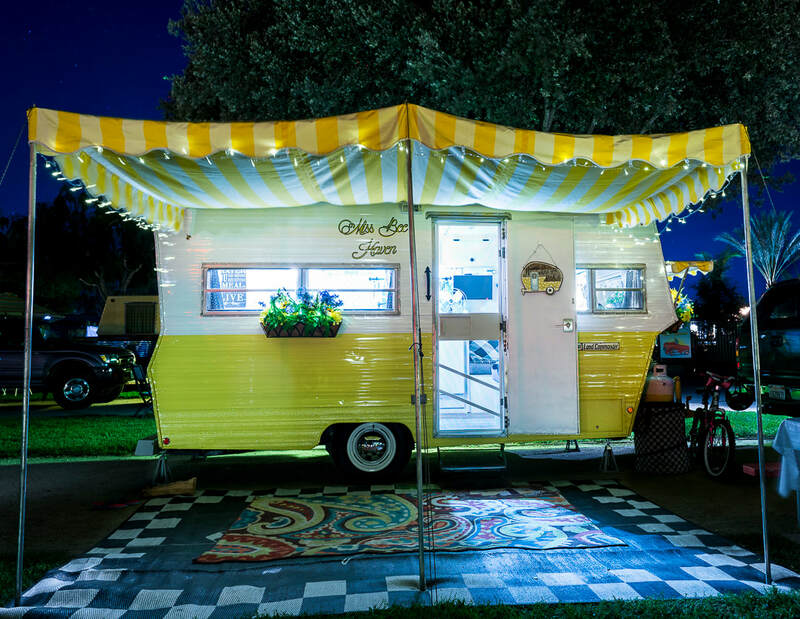 The story is that in 1999 a Los Angeles architect named Bardy Azadmard bought the trailer and spent a decade restoring it with help from Iowa Boys LLC and Wayne Butters. 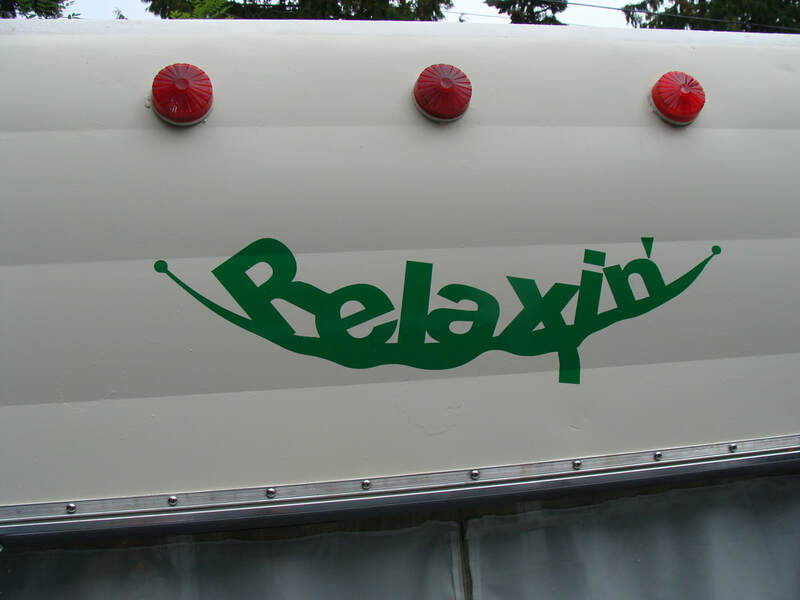 After the trailer was completed, it toured some RV shows until it was sold to someone (in 2011) for a reported six figure sum, and it then shipped to France. Until recently, it was thought to be the only survivor. In 2016 another one turned up. The owner was storing car parts in it and was willing to entertain selling it. Justin Scribner of Flyte Camp found out about it and was interested in acquiring the only other (known to date) surviving Geographic. 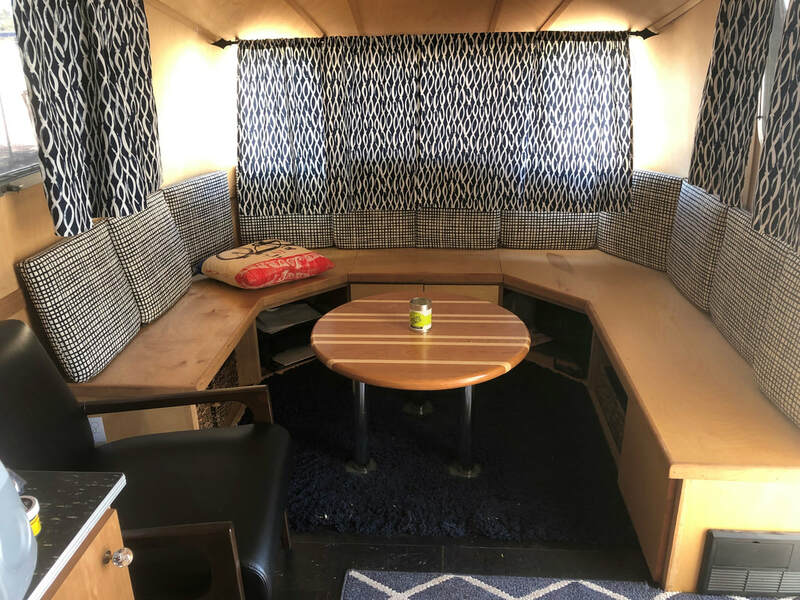 Justin and his wife Anna were able to make a deal with the previous owners and trailered this rare jewel back to Flyte Camp in Bend, OR. 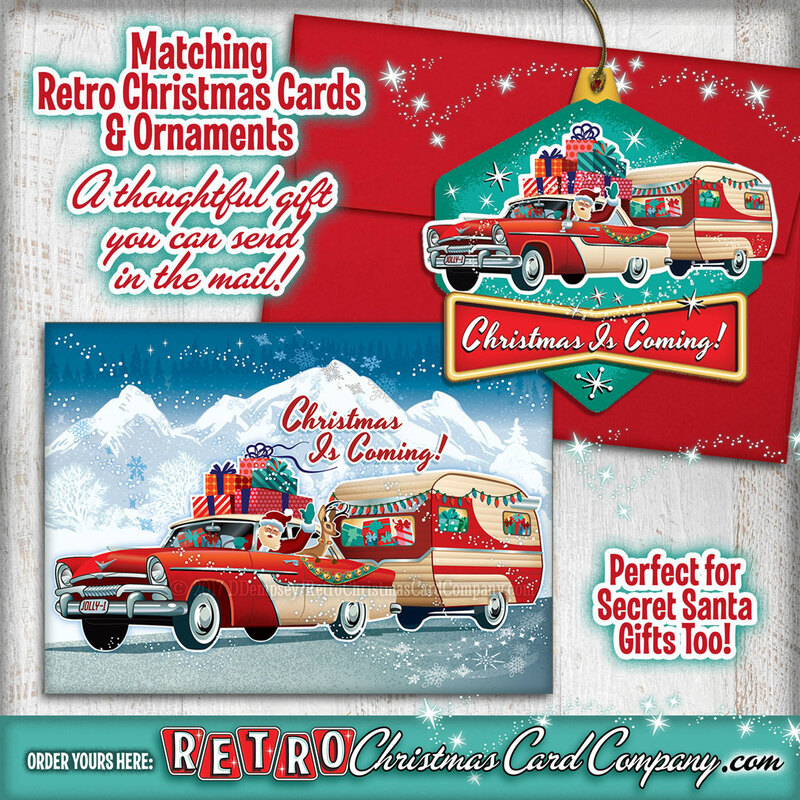 Vintage trailers can be a fun and economical hobby whether you are 16 or 75 years old or somewhere in between. 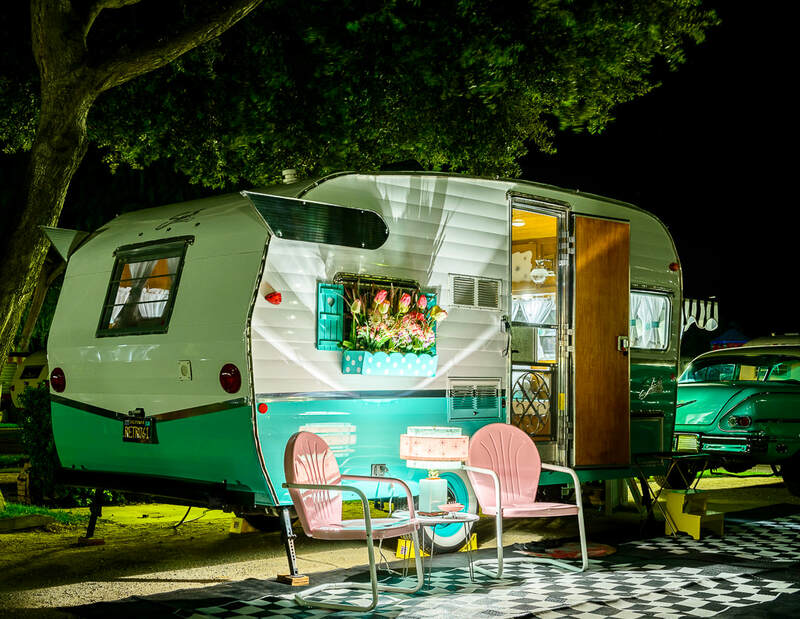 If you can tow a small trailer, you are sure to be welcomed to one of the hundreds of vintage trailer rallies happening across the USA. 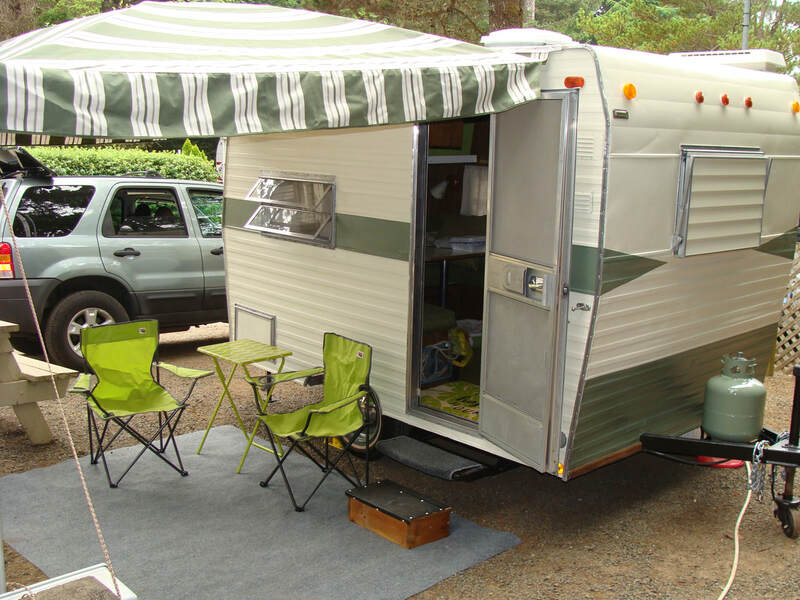 Acquiring your trailer may prove to be the challenging part of the hobby. 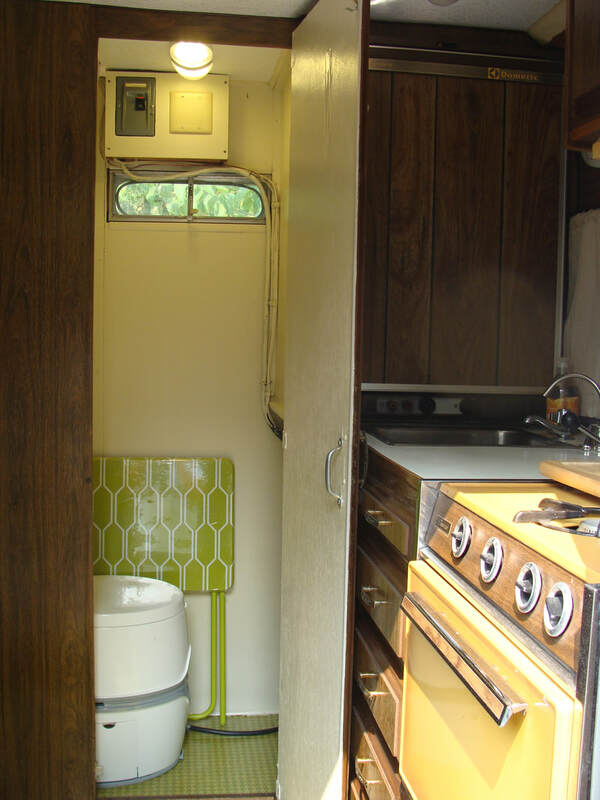 With pre-1969 trailers in such high demand, the prices of restored trailers reflect the investment of time and money put into them by their owners. 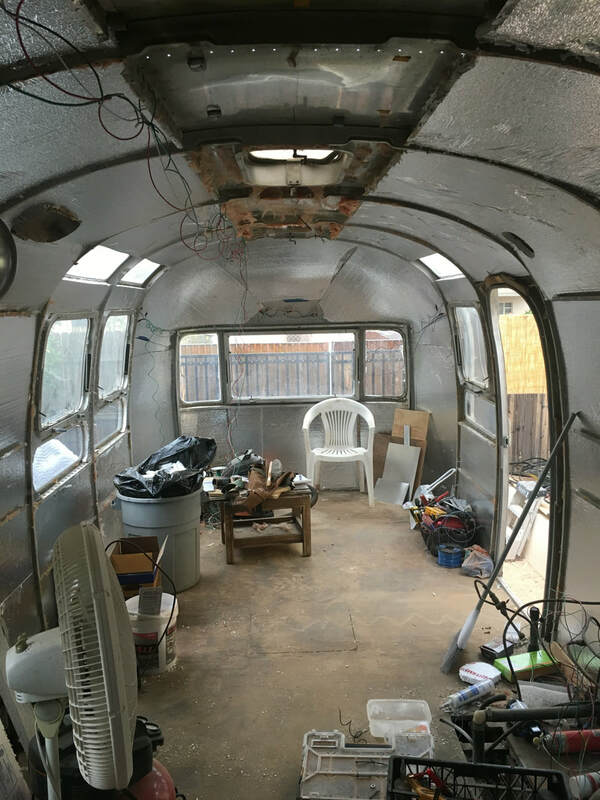 If you are somewhat handy or crafty, or fancy yourself a do-it-yourselfer, you can probably restore your own vintage trailer! For the past 3 years we have brought together professional builders, with dozens of trailerites from across the US and Canada that are eager to learn. The first year we had about 120 attendees, year two 150 and last year 180 attended from as far away as Canada and Maine. 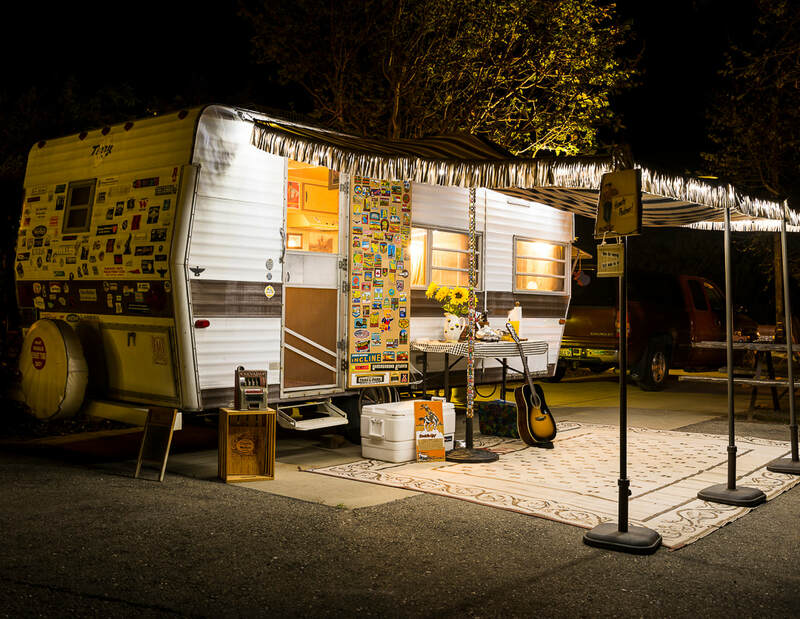 This year will be our 4th annual event and we will be back in Hollister, CA at the Casa De Fruta Campground. You may not be able to fix a complex issue with your refrigerator after one class at VCT Boot Camp, but you will probably learn enough to maintain it and do simple repairs. If it isn’t fixable, installing a new Dometic refrigerator probably won’t seem like such a daunting task. We will sell out at 200 attendees this year. We get started on Thursday March 7th with a Hawaiian style BBQ. Attendees can join in the fun with their favorite Hawaiian shirt! Friday and Saturday we start with coffee and a continental breakfast and have 3-5 different classes going on throughout the day. Attendees are able to attend any of the classes they choose. Lunch is provided both days so you can grab a bite and get to your next class! In the evenings, you can enjoy the camaraderie or grab a bite at the Casa De Fruta Restaurant. Sunday morning we have a farewell assembly and coffee. The VCT Boot Camp is the only event of its type. 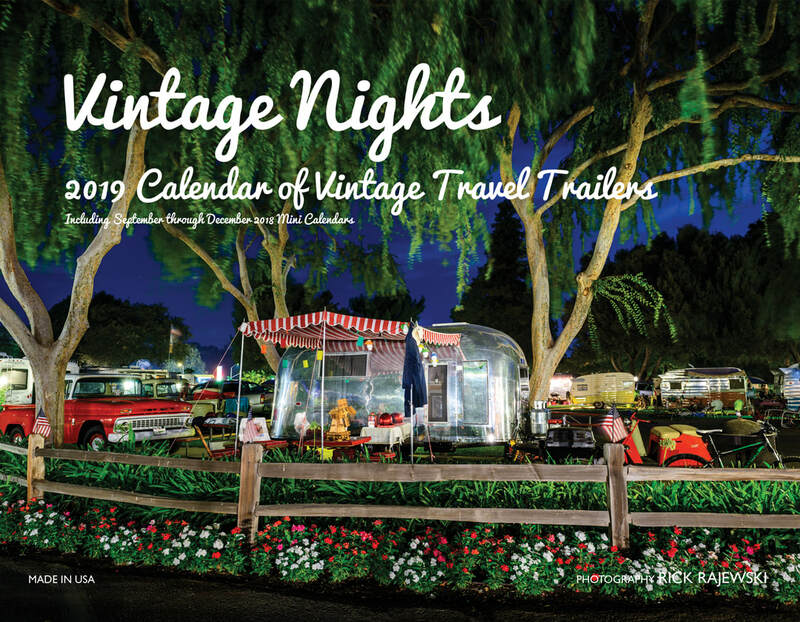 If you are interested in rubbing elbows with a couple hundred like-minded vintage trailer enthusiasts, you can't miss this year’s event. Tickets are on sell now. This event will sell out. Last year the rooms at the Inn were sold out within a few weeks. We have plenty of campsites and hope to see you there no matter where you come from, how you get there, or where you stay!